This story was filed by CBS News foreign affairs analyst Pamela Falk at the United Nations. The leak of information about Afghan President Hamid Karzai's brother and his alleged connection to the CIA and tribal drug lords is curious. Leaks always are. But in this case, the release of this sensitive information is troublesome and potentially game-changing in a dangerous war. Ahmed Wali Karzai (at left) admitted to giving the agency information, but has denied receiving any money from the CIA, or being part of the lucrative Afghanistan opium trade – making him, at least in Washington-talk, that much more guilty. 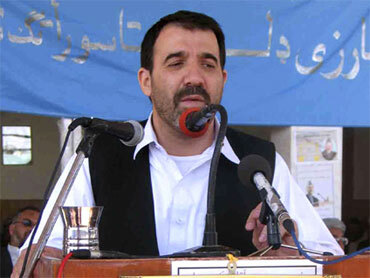 The information, published in the New York Times, first stated that the president's brother was, in effect, the southern sector's political boss, running the election, communicating with the Taliban for the U.S. government, informing the U.S. government of possible attacks, and overseeing several bridges vital to opium traffickers. The U.N.'s report on the drug trade in Afghanistan, "Afghan Opium Survey 2009," released in Kabul by the U.N. Office on Drugs and Crime (UNODC) last month, said the drug lords and the government in Afghanistan had a "marriage of convenience," that the traffickers had built a stand-alone empire similar to South America's Colombian cartels, and that both the Taliban and the Afghan government extracted tariffs on their trade. The analysis of the New York Times' information took it to new levels: Wali Karzai was reported, in other news, to be a major drug lord and a CIA operative. But regardless of the exaggeration, the fact remains that the president's brother has some connection to drug lords – even if it is personally-enriching political expediency – and that relationship is unacceptable by any American foreign policy standards. Senate hearings have been called for — in the day since the information surfaced. The report itself will change the political and military landscape in Afghanistan and Pakistan. The insurgents will use it as proof of the U.S. meddling at the highest level of the Afghan government. In Pakistan, where the use of drones is already being questioned by the U.N. envoy for extrajudicial killings — and the Pakistani Parliament questions the strings on the $7.5 billion U.S. aid package — the equation of the U.S. government to the CIA is devastating. So, the obvious, unanswered question is: who leaked the information? Speculation has begun, but the most curious aspect of the most recent Washington leak is the fact that there is not a major outcry from the administration, from the U.S. military or from the public, for that matter, about the security breach itself. Leaks are to Washington as milk is to a baby. International politics has always run on the politically unsavory use of them. In early October, staffers inside the usually airtight International Atomic Energy Agency (IAEA) leaked a report that is in draft form, of questionable intelligence, and still unpublished, that Iran has sufficient information to be able to design and produce a workable implosion nuclear device, in order to imply that IAEA Director General Mohamed ElBaradei, cautious and with only one month to go in his unblemished tenure, was not allowing the report to be published. More infamous leaks were the Pentagon Papers in the Vietnam era and the Valerie Plame saga, where she was exposed as a CIA agent married to former Bush Administration official, Ambassador Joseph Wilson. The Karzai story may not help the Afghan President's principal opponent in the November 7 election, Abdullah Abdullah, that much, but it will certainly damage Hamid Karzai's credibility and ability to govern. It will also take Ahmed Wali Karzai out of the information trade. The impact could be enormous and, more to the point, it brings to the surface a cavernously deep division between U.S. military intelligence – cited several times in the report – and the administration on Afghan strategy. The speculation is that the request by U.S. and NATO General Stanley A. McChrystal is strengthened by the need to combat the drug lords directly and because the drug trafficking has truly corrupted the Afghan government, implying as well that the Taliban has deeper stakes in the running of the country. The alternative to the political theater of leaks in Washington, are whistleblowers: someone who is willing to commit personal and professional self-destruction by releasing the information with fingerprints. Peter Gabriel, the deputy of the U.N. Mission in Afghanistan, did that a few weeks ago on the extent of the fraud in the Afghan election, and was summarily fired. To a certain extent, General McChrystal already has spoken out publicly for the need for more troops, and has been less outspoken in recent days. Thus, the leak. Somewhere is Washington; someone has an interest in getting the information out, regardless of the possible danger to U.S. strategy and perception of the U.S. role in the war. That is not amazing. The only remarkable thing is that the Obama Administration is not outraged by it. In Washington tealeaf reading terms, that means the administration has the key motive for the leak. With no fingerprints on the information, the speculation will continue. Meanwhile, U.S. war room deliberations on Afghanistan strategy just got a whole lot more complicated.